We are doing our best to make all links on this page workable as soon as possible. Thank you for your patience. 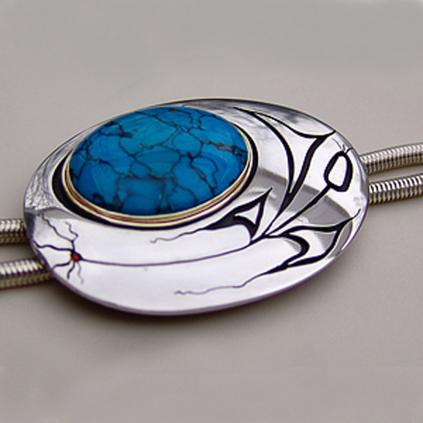 Native American bolo ties, also called bola ties, and scarf slides can be traced back to 19th-century Western slide necklaces and neckerchief slides. Since the mid-20th century the bolo tie we know of today, although still widely associated with Western cowboy wear, has been part of the silver and goldsmithing traditions of the Dine' and the Hopi, Zuni, and other Pueblo Nations from the Four Corners Area in the southern US. Jeweler Zhaawano took it an intruiging step further by making use of the Hopi overlay technique, combined with design elements - such as black-outlined imagery and flowing, calligraphic lines - that mirror in form and spirit the oral and pictographic traditions of the Anishinaabe Peoples that live in the northerly land of the North American Great Lakes. Please click the below bolo tie images to see prices, sizes and used materials, and various other details regarding each design.